This chapter explores the use of competitions to accelerate robotics research and promote science, technology, engineering, and mathematics (STEM) education. We argue that the field of robotics is particularly well suited to innovation through competitions. Two broad categories of robot competition are used to frame the discussion: human-inspired competitions and task-based challenges. 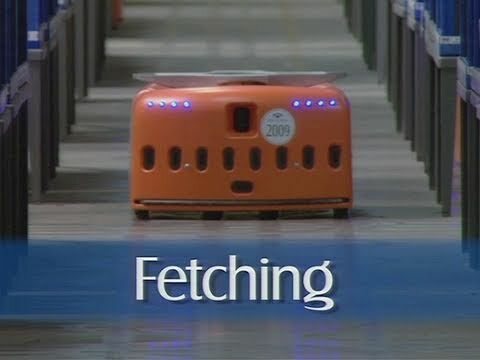 Human-inspired robot competitions, of which the majority are sports contests, quickly move through platform development to focus on problemsolving and test through game play. Taskbased challenges attempt to attract participants by presenting a high aim for a robotic system. The contest can then be tuned, as required, to maintain motivation and ensure that the progress is made. Three case studies of robot competitions are presented, namely robot soccer, the UAV challenge, and the DARPA (Defense Advanced Research Projects Agency) grand challenges. The case studies serve to explore from the point of view of organizers and participants, the benefits and limitations of competitions, and what makes a good robot competition. This chapter ends with some concluding remarks on the natural convergence of humaninspired competitions and task-based challenges in the promotion of STEM education, research, and vocations. In this video, we can see the coordination and passing strategy as an example of the play of the RoboCup small-size league (SSL), in this case, the CMDragons team from Veloso and her students, at Carnegie Mellon University. The RoboCup SSL has an overhead camera connected to an offboard computer which plans and commands the robots: The perception, planning, and actuation cycle is fully autonomous. The preface of the Second Edition of the Springer Handbook of Robotics contains three videos about the creation of the book and using its multimedia app on mobile devices. This video illustrates the joyful mood of the big team of the Springer Handbook of Robotics at the completion of the Second Edition. 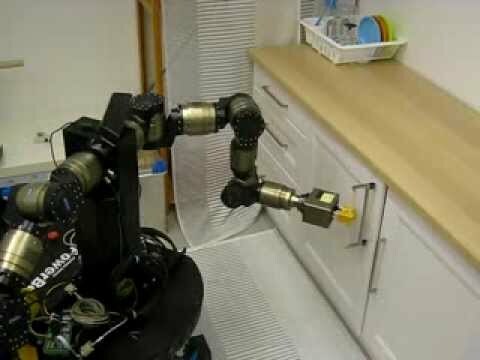 The development of robotic systems capable of sharing with humans the load of heavy tasks has been one of the primary objectives in robotics research. At present, in order to fulfil such an objective, a strong interest in the robotics community is collected by the so-called wearable robots, a class of robotics systems that are worn and directly controlled by the human operator. Wearable robots, together with powered orthoses that exploit robotic components and control strategies, can represent an immediate resource also for allowing humans to restore manipulation and/or walking functionalities. The present chapter deals with wearable robotics systems capable of providing different levels of functional and/or operational augmentation to the human beings for specific functions or tasks. Prostheses, powered orthoses, and exoskeletons are described for upper limb, lower limb, and whole body structures. State-of-theart devices together with their functionalities and main components are presented for each class of wearable system. Critical design issues and open research aspects are reported. The video shows the hand exoskeletons, highlighting the mechanism adopted for implementing the finger kinematic and the specifically-designed force sensors integrated into the mechanical structure. Within the context of multiple mobile, and networked robot systems, this chapter explores the current state of the art. After a brief introduction, we first examine architectures for multirobot cooperation, exploring the alternative approaches that have been developed. Next, we explore communications issues and their impact on multirobot teams in Sect. 53.3, followed by a discussion of networked mobile robots in Sect. 53.4. Following this we discuss swarm robot systems in Sect. 53.5 and modular robot systems in Sect. 53.6. While swarm and modular systems typically assume large numbers of homogeneous robots, other types of multirobot systems include heterogeneous robots. We therefore next discuss heterogeneity in cooperative robot teams in Sect. 53.7. Once robot teams allow for individual heterogeneity, issues of task allocation become important; Sect. 53.8 therefore discusses common approaches to task allocation. Section 53.9 discusses the challenges of multirobot learning, and some representative approaches. We outline some of the typical application domains which serve as test beds for multirobot systems research in Sect. 53.10. Finally, we conclude in Sect. 53.11 with some summary remarks and suggestions for further reading. This chapter describes motion planning and obstacle avoidance for mobile robots. We will see how the two areas do not share the same modeling background. From the very beginning of motion planning, research has been dominated by computer sciences. Researchers aim at devising well-grounded algorithms with well-understood completeness and exactness properties. The challenge of this chapter is to present both nonholonomic motion planning (Sects. 47.1–47.6) and obstacle avoidance (Sects. 47.7–47.10) issues. Section 47.11 reviews recent successful approaches that tend to embrace the whole problemofmotion planning and motion control. These approaches benefit from both nonholonomic motion planning and obstacle avoidance methods. 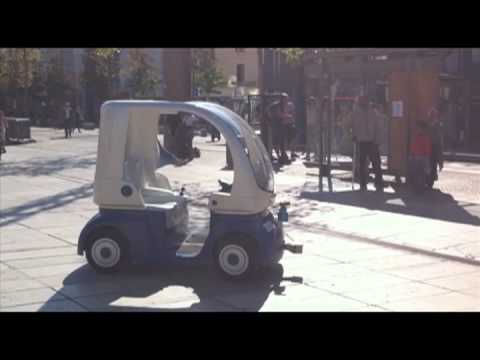 This video shows the vision-based autonomous navigation of a Cycab mobile vehicle able to avoid obstacles detected by its laser range finder. The reference trajectory is provided as a sequence of previously-acquired key images. Obstacle avoidance is based on a predefined set of circular avoidance trajectories. The best trajectory is selected when an obstacle is detected by the laser scanner. 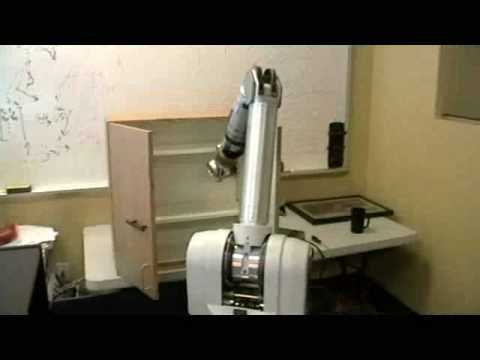 Mobile manipulation requires the integration of methodologies from all aspects of robotics. Instead of tackling each aspect in isolation,mobilemanipulation research exploits their interdependence to solve challenging problems. As a result, novel views of long-standing problems emerge. In this chapter, we present these emerging views in the areas of grasping, control, motion generation, learning, and perception. All of these areas must address the shared challenges of high-dimensionality, uncertainty, and task variability. The section on grasping and manipulation describes a trend towards actively leveraging contact and physical and dynamic interactions between hand, object, and environment. Research in control addresses the challenges of appropriately coupling mobility and manipulation. The field of motion generation increasingly blurs the boundaries between control and planning, leading to task-consistent motion in high-dimensional configuration spaces, even in dynamic and partially unknown environments. A key challenge of learning formobilemanipulation consists of identifying the appropriate priors, and we survey recent learning approaches to perception, grasping, motion, and manipulation. Finally, a discussion of promising methods in perception shows how concepts and methods from navigation and active perception are applied. Covariant functional gradient techniques for motion planning via optimization. Computer simulations and video demonstrations based on two experimental platforms: Barrett Technologies WAM arm and Boston Dynamics LittleDog. Multisensor data fusion is the process of combining observations from a number of different sensors to provide a robust and complete description of an environment or process of interest. Data fusion finds wide application in many areas of robotics such as object recognition, environment mapping, and localization. This chapter has three parts: methods, architectures, and applications. Most current data fusion methods employ probabilistic descriptions of observations and processes and use Bayes’ rule to combine this information. This chapter surveys the main probabilistic modeling and fusion techniques including grid-based models, Kalman filtering, and sequential Monte Carlo techniques. This chapter also briefly reviews a number of nonprobabilistic data fusion methods. Data fusion systems are often complex combinations of sensor devices, processing, and fusion algorithms. This chapter provides an overview of key principles in data fusion architectures from both a hardware and algorithmic viewpoint. The applications of data fusion are pervasive in robotics and underly the core problem of sensing, estimation, and perception. We highlight two example applications that bring out these features. The first describes a navigation or self-tracking application for an autonomous vehicle. The second describes an application in mapping and environment modeling. The essential algorithmic tools of data fusion are reasonably well established. However, the development and use of these tools in realistic robotics applications is still developing. Jet Propulson Lab, Pasadena, applies telerobotic inspection techniques to space platforms. In this short video, the effectiveness of the passive sampling approach and IPC control are shown. A "PD" like control is implemented digitally in the classical way and also using IPC and passive sampling. At the used sampling frequency of 30 Hz, it is shown that instability occurs for the standard implementation, but is completely absent in the proposed way. We propose a method that can open doors without prior knowledge of the door's kinematics. The method consists of a velocity controller that uses force measurements and estimates of the radial direction based on adaptive estimates of the position of the door hinge. The control action is decomposed into an estimated radial and tangential direction, following the concept of hybrid force/motion control.